Hello all my lovely readers!! Happy Friday!! Let me start today's post by explaining a little bit about this year's Christmas at The Shabby Nest. As you may know, we are moving. Well, here's the kicker...we're moving out BEFORE Christmas. Yes. BEFORE Christmas. (note to self....never move at Christmas time again.) We will be spending the actual holiday with my in-laws which will be absolutely lovely, but in the meantime things are a bit, shall we say, chaotic. Still, I couldn't let a house with four kiddos go without a Christmas tree now could I? So this past Tuesday, we made our annual trek with the Hubby's family to a Christmas tree farm about an hour away (the same place his family has been going for the last 37 years) to get our tree. I told the Hubby that since we are moving, I was not pulling out the regular Christmas decor, and I wanted a small tree. We found the perfect little tree. Once we got it home and put the lights on it, I explained to the kiddos that we were going to do something a little different this year. They were fine with that as long as there were still Christmas lights involved...because to them, that's all that really mattered. I printed out a bunch of black and white family photos (wallet sized) and simply punched holes in them and added twine to hang. That was the end of day one (and the tree was not done). The next day, the Toddler Demolition Team and I made a trip to Walm*rt and purchased a package of stencils. The kids thought I was a little nuts, but they humored me. I punched holes in the cards and added twine as well. Instead of a tree skirt, I just wrapped the base in some pretty black and white damask fabric that I had in my stash. It lends itself well to the color scheme and adds a bit of elegance as well. There's some frugal decorating going on here, oh yeah! And you know, I think this may just be one of my favorite trees yet. Everyday I get to look at the faces of those I adore smiling back at me from a tree that celebrates the most wonderful season of the year. Isn't that what it's all about? That looks great! You would never know it cost so little. What would be do without the Pottery Barn catalog for inspiration?? OMG! 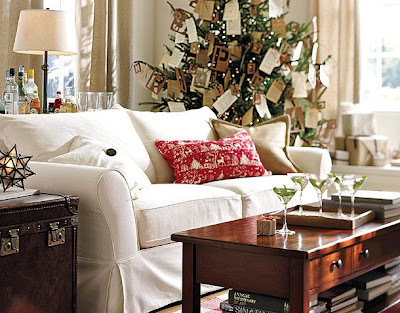 I just did a post with the same idea of stencil ornaments AND the pottery barn photo! :-) Your tree looks ADORABLE and I LOVE the star topper. I like your stencil better than mine too. Have a good weekend! WOW this is great! I love eveything about it. What a fabulous idea. That tree is amazing - I love it! I just read the Room Remix and saw the stencils too - LOVE LOVE LOVE it! Great job! Thanks for sharing this! I love the way the tree looks! $3.49, that is unreal! Have a great Friday! Where are you moving too? Hugs! Very nice tree, I love your simple, yet beautiful ideas. wow I can't beleive that is all you spent. It's just as nice as the PB tree too! i must go and get me some of those stencils! oh, the possibities! thanks for the tip! love the tree! The photos are the perfect touch! Creative idea! So easy and looks like lots of fun! Your $5 tree decor beats my $20 decor budget!!! But I had so much FUN trying to come up with ideas and make everything. So KUDOS to those of us, thinking outside the BOX, being frugal and ENJOYING the simple homemade Christmas ideas!!! Thanks for sharing. Beautiful post, gorgeous tree. That is a wonderful tree! How creative! I think it looks great! Love the idea of the b&w's! Thanks for sharing! We just moved at the beginning of October and it was CRAZY! I can't imagine moving at this time of year! God bless your soul! Have a great one! We aren't moving but my little man is 16 months and a maniac so I didn't want to put all the little ornaments and hooks and stuff on tree. I guess great minds think alike, huh? : 0 I put cardboard on the back of mine and hot glued red ribbon to the back to hang them with. I love the result. I am loving the stencils though. Such a great touch! Thanks for sharing your beautiful tree! OH, I just love it! It's so pretty! Way to go! I am admiring your frugalness! I love it!! The stencils are just the right touch along with the B&W photos! I love that in the midst of all the moving craziness you & your family are going through, you created a beautiful, special memory for your children. Beautiful tree! The stencils add such a neat touch. 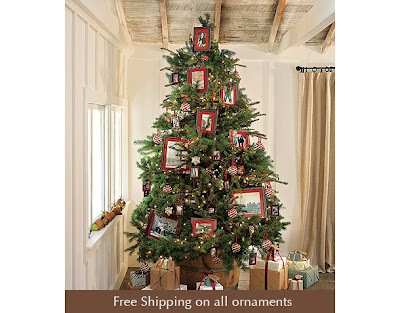 This might be the best tree I have seen decorated in blogland! I have a 5ft tree in the family room where my 3 little ones play and have opted not to add ornaments so I don't spend the day saying "STOP TOUCHING THE TREE"! I love this idea and think I will do the same. Thanks for the inspiration! Hey, your tree looks better than most glitzy, all decked out trees! I love it! My husband works out of town and I printed out pictures for his little tree. Such an inexpensive idea and even more meaningful! Yours looks fabulous! Thanks for being so wonderful and sharing all your amazing ideas! !You've given me so much courage to try my dream. I think it looks wonderful and so special! You are so creative! Even harder, my kids and grandkids are here and wont be up there where Im going. My closing will be in a week or so, so I dont have any decor out and Im going nuts here. This is wonderful! Your tree looks gorgeous. I love the fact that you didn't forgo the tree, even though you're about to move. GOOD FOR YOU. And good for us, because we get a glimpse at how wonderful it can look for so little money! Thanks for an inspiring post. How WONDERFUL! I haven't read all the comments & maybe someone has already mentioned it, but wouldn't this be fun to do with sheet music? "Silent Night", or maybe the Hallelujah Chorus? I'll be moving Christmas week, but I see a project for next year!!! Thanks for sharing! OHHH LOVE it! I did some dollar store decorating too this year! Your tree is lovely and so FULL of memories! Did you print the photos on special paper? I love the picture tree idea! Hi MOTB...hope you drop by again...I just printed the photos on cardstock. Nothing fancy, but nice and thick. Love your Christmas trees, these are some great tips!! Thanks for sharing them! Merry Christmas! Fabulous!!! I love, love, LOVE the family tree!!!! ♥ it! Your house looks fabulous! Absolutely love your tree. So original, and I love the price tag! Cute tree, great idea. GOD BLESS AND MERRY CHRISTMAS. We just moved to our new house Thanksgiving week. In my last move I got crazy and threw out all my old shatterproof ornaments to force myself to redo the tree this year. Well, it's less than 2 weeks to Christmas, and my tree is still bare. Thanks for the great idea! I think I'll start on it this afternoon! I'm really enjoying the 2009 Christmas Home Tour. Many of you are so talented and creative. I love your use of twine. I recycle Christmas cards ~ punching a hole and tying a ribbon. I'll definitely use twine next year. Your decorations are so beautiful! Holy DARLING!!! Oooo I love it! !